I read your Blog regularly. 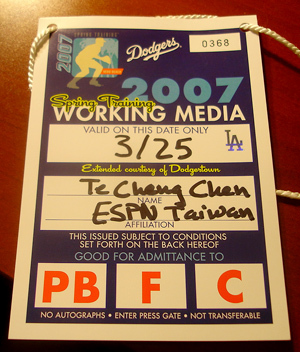 Just learned that you got a chance to interview those star baseball players from Taiwan. Since you are not a professional journalist, you probably don't know that people, working as reporters, are not supposed to ask for signatures from players. This is the rule of the games in the US. And you should know this too. Ya, I learned this rule at the first day of work. Still thanks for your friendly reminder.